Italian President Giorgio Napolitano is considering ways out of an acute political crisis after ex-PM Silvio Berlusconi’s ministers left the coalition government. This follows weeks of worsening ties between Silvio Berlusconi’s party and PM Enrico Letta’s centre-left grouping. Silvio Berlusconi had already threatened to withdraw his ministers if he was expelled from the Senate for tax fraud. The current coalition government was put together after inconclusive elections in February, and the latest developments cast a further shadow over Italy’s struggling economy, the eurozone’s third-largest. It is feared that the crisis could hamper efforts to enact badly-needed reforms to tackle Italy’s economic problems, including debt, recession and high youth unemployment. The IMF has warned that coalition tensions represent a risk to the Italian economy. Speaking on Saturday, Giorgio Napolitano called for political continuity in the country. “We need a parliament that discusses and works, not that breaks up every now and then,” he said. 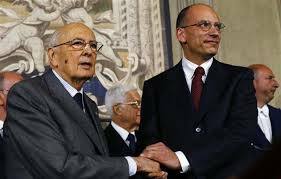 Later on Sunday, Giorgio Napolitano is expected to meet Enrico Letta, and their talks will be closely watched for the first indications as to how this crisis will play out. Enrico Letta, of the centre-left Democratic Party, warned late on Friday that he would quit unless his coalition cabinet won a confidence vote due next week. Silvio Berlusconi pre-empted that, describing Enrico Letta’s comments as “unacceptable”. He later said all five ministers of his People of Freedom (PDL) party were resigning. Interior Minister and PDL Secretary Angelino Alfano accused Enrico Letta of “a grave violation of the pacts that this government is founded on”. But the prime minister responded angrily to the resignations, accusing the PDL leader of telling Italians a “huge lie” in using the sales tax as an alibi for his own personal concerns. Silvio Berlusconi’s legal problems are seen as a cause of much of the tension inside the coalition. Silvio Berlusconi was sentenced to a year in jail, but is expected to serve house arrest or community service because of his age.